-SGX Nifty is indicating a positive opening for the Indian markets following a rally in global equities on trade talks optimism between US-China. -Nifty finds support around 10800, while 10930 will act as resistance. -FII/DII Data: In yesterday’s trading session, FIIs sold 466 crores stock in the cash market, whereas DIIs sold 122 crores worth of stock. In the derivative market, FIIs bought 401 crores of Index futures and bought 607 crores worth of Index options. -US, Asian markets gain on optimism on trade talks and deal to avoid g US stocks rally strongly as trade talks see positive response from President Trump. Also, US shutdown gets averted as Congress members give in which sees stocks soar higher. Asian indices opened in the green as positive US cues saw the Japanese Nikkei rise 200 points in early trade after a 500 point rally yesterday. -Brent crude ended 1.48% higher at $62.42/barrel. -Rupee gained 48 paise to close at one-month high of 70.70/$. -Alembic Pharma gets USFDA approval for Fenofibrate tablets. -Institutional investors put in Rs8,000cr bids for SUUTI stake in Axis Bank. -JSW Steel declared winning bidder for Bhushan Power & Steel. -Result review: Coal India (PAT up 50.1% yoy, Beats Estimates), Sun Pharma (PAT up 286.2% yoy, Beats Estimates), Hindalco (PAT down 45.3% yoy, Misses Estimates). 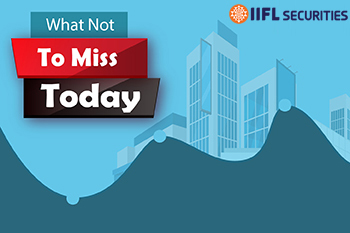 -Results today: Bharat Forge, Fortis Healthcare, Bosch, Godrej Industries, Reliance Capital, Aster DM Healthcare, Gulf Oil Lubricants India.